Though not mentioned by name, we first learn of the Surf's Up Saloon as Billly's preferred hangout in Brooklyn's book Shell Game. Later in Aloha Texas, Nick informs us his bachelor pad is over a bar. Yep. That too would be the Surf's Up. And in Dive into You we get the chance to learn a little more when Doug and Emily introduce us to the owner Steve Kapula and his brother Ben. 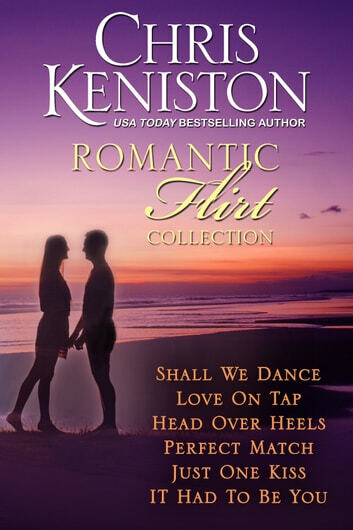 Unable to resist playing with these fun new characters, as well as with the well-loved heroes from the Aloha Series, between Aloha books Chris Keniston has brought you fun stories she calls Flirts. What's a Flirt you ask? It's a very short story, like a television episode, set in the Aloha Series world. Specifically, at the Surf's Up Saloon. It's a wonderful chance to drop in and play with old friends and new and now Chris has brought you six sweet Flirts in one easy to read collection ! Jokingly Chris refers to her Flirts as Cheers meets Love American Style ! Pick up a copy and find out why !